This chart represents the approximate amount of liquor recommended based on the number of people/guests. The anticipated time of the reception is usually for a one hour cocktail hour and a four hour reception.The amount may vary due to the type of crowd (older vs younger), the time of the day and the weather conditions. 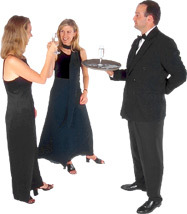 Joe Canals can assist you with your Liquor and Beverage needs at all special events. (More beer and white spirits, such as vodka & gin will be consumed during the summer months. )Typically, a caterer will supply mixers and/or setups, but in the event they do not, we will be glad to assist you in picking them out.Thank you for shopping at Joe Canal’s Discount Liquor Outlet. IMPORTANT NOTE: The following chart provides two common bottle sizes (for most items shown below) with regard to the suggested amount of liquor that is recommended, based on the number of people/guests. Shown below are the suggested amounts in 1 Liter Bottle and 1.75 Liter Bottle sizes for most liquor items and other suggested sizes for wine, champagne and beer. Under each column (for the number of people/guests) you’ll see two numbers, the first number represents the number of bottles recommended if purchasing “1 LITER” sized bottles. The second number represents the number of bottles recommended if purchasing “1.75 LITER”sized bottles. (For example, 3 / 2 , the “3″ represents the quantity of THREE – 1 LITER BOTTLES and the “2″ represents TWO – 1.75 LITER BOTTLES. )If you have any questions, feel free to email or call your local Joe Canal’s Discount Liquor Outlet.